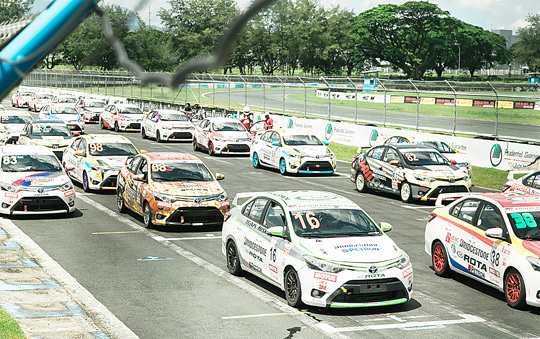 Long-time Philippine motorsports advocate Toyota Motor Philippines is elevating its homegrown motorsports program this year with the launch of the Vios Racing Festival 2019. Kicking off in April, the Vios Racing Festival will “continue the trailblazing legacy of the Vios Cup,” TMP President Satoru Suzuki said, referring to the long-running program that has brought motorsports closer to Filipino racing fans for five years now. For this year, TMP aims to deliver the action and excitement of motorsports to an even wider audience - bringing the thrill of racing not just to car enthusiasts but to anyone who wants to experience the heart-pumping excitement of driving. “Through the Vios Racing Festival 2019, Toyota makes the waku doki experience more personal by intensifying the overall experience,” said Suzuki. Waku Doki is a Japanese term that describes that surge of emotion and joyful anticipation that one feels especially in thrilling and intense moments. It’s the Waku doki principle that defines Toyota’s racing programs all over the world. Vios Racing Festival 2019 will include the Vios Circuit Championship that will have racers competing at the Clark International Speedway. The Philippines’ Vios Racing Festival will have two major elements - the Vios Circuit Championship and the Vios Autocross Challenge. The Vios Circuit Championship will have racers tackling the tracks of Clark Speedway in Pampanga using the All-New Vios. Participants from different areas in the country and of different backgrounds will be classified under three classes - promotional, sporting, and celebrity. The Vios Autocross Challenge meanwhile will have racers in a timed competition within a specially designed obstacle course where participants can share the tracks with celebrities, media, and car club racers. It will be held in Metro Manila, with the goal of making the races more accessible to the public, whether as participants or spectators. Side events outside the racetrack will also be put up to cater to those who are interested in other automobile-related activities like Toyota test drives. Through these activities, TMP wishes to not only promote the sport, but also to instill among Filipinos the importance of improving driving skills and prioritizing safety. “To boost and encourage the Filipino interest in motorsports, we will also bring back the greatly-missed Toyota Racing School,” said Suzuki. Through its official motorsports partner Tuason Racing School, TMP will be helping participants enjoy optimal racing experience.